Montana Original Boar's Hair Car Wash Brushes is a soft, gentle car wash brush for cars, trucks, SUVs, and boats. Home > Car Care Products > Car Wash Products > Montana Original Boar's Hair Car Wash Brushes - On Sale! Boar's hair is nature's most durable hair. This soft yet strong hair is more durable than camel hair and sheds less than horse hair. It's no wonder that so many car collectors and aficionados use nothing but genuine boar's hair brushes to gently clean their fine vehicles. Boar's hair is naturally thick and sturdy. It doesn't fall limp when wet and it holds a tremendous amount of water. These features make it the ideal paint-safe wash tool for fine finishes. The bristles easily release dirt into the wash bucket rather than rubbing it on the vehicle. 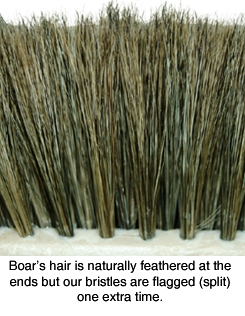 And, because there are no nylon or other synthetic bristles, a boar's hair brush will not scratch delicate surfaces, like clear coats, gel coats, glass, Plexiglas or fiberglass. Autogeek carries a large assortment of boar's hair wash brushes to suit your washing needs. 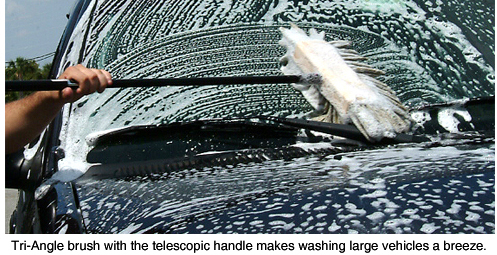 Wash tall SUVs, trucks, vans, and RVs with the help of our telescopic handle. Brushes are sold with or without the handle, and you can buy the handle separately. All the brushes listed here are 100% genuine boar's hair permanently glued to molded plastic blocks. All, with the exception of the Montana Original Boar's Hair Wash Brush, are threaded for the Telescopic Handle.